The most popular Christmas plant in North America is certainly the poinsettia (Euphorbia pulcherrima). There is scarcely a store that doesn’t sell them or a home that isn’t decorated with one. But there are other Christmas plants, including Christmas cactus (Schlumbergera spp. ), Christmas kalanchoe (Kalanchoe blossfeldiana), amaryllis (Hippeastrum spp. ), Christmas pepper (Capsicum annuum), Jerusalem cherry (Solanum pseudocapsicum), frosted fern (Selaginella martensii ‘Frosty’), Norfolk island pine (Araucaria heterophylla) and, more recently, wintergreen (Gaultheria procumbens). Christmas trees are popular all over North America, too. Fir trees (Abies spp.) are the biggest sellers, but Douglas firs (Pseudotsuga menziesii), spruces (Picea spp.) and pines (Pinus spp.) are widely used. The Christmas fern (Polystichum acrostichoides) was once commonly used in Christmas wreathes, garlands and centerpieces in Eastern North America, as it has evergreen fronds that last all winter and are thus available at Christmastime, but its star has waned considerably. It’s just too easy to find longer-lasting artificial or preserved foliage for such use these days. The Christmas fern still makes a great garden plant for shady spots and is hardy to zone 3. The branches of winterberry (Ilex verticillata) have fared better over time and are still widely used. This deciduous holly, native to eastern North America, is leafless at Christmas, but its branches are covered with bright red berries that create great swaths of color in Christmas arrangements. You can grow them yourself (the shrub is hardy to zone 3 and you will need to include at least one male plant in your planting to pollinate the berry-bearing females), but you can also buy branches in florist shops … including fake ones, unfortunately. That covers most of the plants associated with Christmas in North America, but Christmas plants differ around the world. Let’s take a look at what’s going on elsewhere. In general, the plants featured in the first paragraph—poinsettias, Christmas cactus, Christmas kalanchoe, etc.—are also popular in Europe, although the poinsettia, even though it is not rare per se, is not as popular as on this side of the Atlantic. But there are other plants associated with Christmas (and New Year’s Day) that are more specific to Europe. For example, holly (Ilex aquifolium) is a European shrub or tree with spiny-edged, shiny, leathery, evergreen leaves and red berries and is grown in many Old World gardens. True enough, holly is available on a limited basis in North America too (although are mostly seem either on Christmas cards or as sprigs of plastic leaves), but nothing to the extent to which it is used in Europe, where, in some countries, sprigs of holly are found on nearly every window ledge and doorway. This tradition has come to be seen as a sign of welcome, but is in fact based a centuries-old belief that putting holly on all possible entranceways would prevent evil spirits from invading the home. Kissing under the mistletoe during the Christmas season is a very old European tradition and can be traced back to the time of the Druids, who laid down arms and exchanged greetings under the mistletoe, considered to be a very sacred plant. Mistletoe is a parasitic plant that grows on tree branches, counting on sap it absorbs from its host for its survival. European mistletoe (Viscum album)—with its translucent round white berries—is the original variety to kiss under. The tradition of kissing under the mistletoe was brought over to the New World and thrived for awhile, but now appears to be dying out. Certainly mistletoe is now only available very locally in North America: I haven’t seen a sprig of it in years! It’s still widely used in Europe during the holiday season. English ivy (Hedera helix) is a traditional Christmas plant in Europe, widely used in holiday garlands and wreaths. Think of the carol The Holly and the Ivy, for example. And why not, since this evergreen climber grows abundantly everywhere on that continent and so is readily available! The tradition of using ivy as a Christmas decoration never caught on in North America, probably because ivy is neither native nor widely grown, though it has escaped from culture to become abundant in a few areas. Harvesting ivy for Christmas decorations is something that could be encouraged as a control measure in areas (mostly on the US West Coast) where ivy is proving to be a pernicious weed. The Christmas rose (Helleborus niger) is not a rose (Rosa spp.) at all, of course, but a perennial. It’s a traditional Christmas plant in southeastern Europe, notably in areas where Orthodox Church is the common religion. Orthodox Christmas takes place about two weeks later than in Western rites, around January 7. And this very early perennial is usually in bloom by then. Although mainly used in flower beds or naturalized in woodlands, it’s also sold as a gift plant at that season. Elsewhere in Europe and pretty much everywhere in North America, this plant flowers too late to be a Christmas plant. Where I live, it isn’t even in bloom at Easter … it’s more like a Mother’s Day plant! In Europe, the tradition of Christmas trees is well established and often spruce or pine, or even a juniper or other conifer, are used, depending on what is available locally. The tradition of the Yule log has largely died out in Britain and Central Europe as it has in North America, but in many parts of Europe, notably in Scandanavia and Eastern Europe, it remains deeply entrenched. A Yule log is a very large hardwood log, the idea being to light it on Christmas Eve and have it burn through the night and Christmas Day. In the Balkans, the Yule log is called a badnjak (or budnik, according to the local language) and it is usually an oak, a symbol of longevity. Those who do not have a fireplace to burn a log in often decorate their apartment with twigs of oak. In France, Belgium and Switzerland, the Yule log (bûche de Noël) has morphed into a log-shaped cake, traditionally served at Christmas … you don’t need a fireplace for that! The main Christmas plant in this region is the pomegranate (Punica granatum): a perfect choice, as it matures at just the right time of year. Doors, fireplaces, tables, etc. are decorated with pomegranate fruits, both fresh and artificial. Two other plants often used in Christmas decorations are the shrubs butcher’s broom (Ruscus aculeatus) and firethorn (Pyracantha spp. ), both bearing evergreen foliage and red berries. In Israel, olive branches (Olea europaea) are offered at Christmas to friends as a symbol of peace. The poinsettia (Euphorbia pulcherrima) is native to Mexico and is popular in there, where it’s known as flor de Nochebuena (Christmas Eve flower). Butcher’s broom and firethorn, brought over from Spain, are also popular, as well as are several local plants that bloom at Christmas. Manzanita, also called tejocote or manzanilla (Crataegus mexicana), a large-berried hawthorn, is another plant traditionally used as a Christmas decoration in many parts of Mexico and Central America. The orange fruits may be threaded onto a garland and are also used to make Christmas punch. One of Mexico’s most curious Christmas traditions, however, is the Night of the Radishes (Noche de Los Rábanos), celebrated in the region of Oaxaca on December 23rd. In it, radishes are carved and arranged into some very impressive displays. Since most of this continent lies south of the equator, the seasons are inverted and Christmas takes place in summer, not winter. That means traditional Christmas plants of the Northern Hemisphere bloom six months too late for Christmas. As a result, the poinsettia is called “Easter flower” (flor de pascua) in many South American countries, because it blooms at Easter, while our Christmas cactus (Schlumbergera) is called “flor de maio” (May flower) in its country of origin, Brazil. Yet there is a Christmas cactus in these countries. The plant we call Easter cactus (Hatiora gaertneri, formerly Rhipsalidopsis gaertneri) in the North is the “cactus de Navidad” and blooms at Christmas in much of South America. Colored berries of the Brazilian peppertree (Schinus terebinthifolius). Source: Javier Alejandro, flickr. South Americans tend to use native plants as cut flowers or holiday plants at the Christmas season. Branches of the Brazilian peppertree (Schinus terebinthifolius) and its cousin, Peruvian peppertree (S. mollis), known in the north for the pink peppercorns they produce, are often used to decorate churches and houses during the holiday season, as they are loaded with small red berries at that time of year. Venezuela has its own Christmas orchid that blooms for the holidays: Cattleya perciviliana. Elsewhere in South America, the usual “orquídea de navidad” is Angraecum sesquipedale, actually native to Madagascar, but widely grown for its large white star-shaped flowers. It’s also called estrella of Belén (star of Bethlehem), but then, so are many other white, star-shaped flowers, including bulbs of the genus Ornithogalum. In Paraguay, house and Christmas displays are often decorated with “flores de coco,” the long, fragrant inflorescences of a local palm tree, the coyol (Acrocomia aculeata). This pre-Christian tradition comes from the indigenous Guarani people. In general, the concept of Christmas is relatively new to this continent and the celebration is mostly a commercial one of American inspiration, so there are often no traditional plants associated with the holiday, at least not long-standing ones. Most are the same Christmas plants seen in North America (poinsettias, Christmas cacti, etc.). Christmas trees, almost nonexistent only 30 years ago, for example, are now seen everywhere, although more often in shopping centers than in private homes. Usually artificial trees are used. The Christian population in Japan is more firmly established than most in Asia and has solidly adopted the tradition of the Christmas tree, usually a real fir or spruce tree. Heavenly bamboo, Nandina domestica, which is not a bamboo at all, but a shrub, is the second-best-known Christmas plant, with its scarlet fruits and red winter leaves. Chrysanthemums (Chrysanthemum morifolium), popular in all seasons in Japan, are widely used at Christmas too. In China, an apple wrapped in colored paper or stamped with an appropriate seasonal message is often offered as a gift on Christmas Eve because the word “Christmas Eve,” translated as “night of peace” (Ping’an Ye) in Mandarin, sounds like the word apple (píngguǒ). In the tropical regions of Asia, the Christmas palm (Adonidia merrillii), better known by its old name, Veitchia merrillii, is widely grown. With its stocky trunk and relatively short fronds, it looks like a dwarf royal palm … and bears bright red fruit at Christmas. Originally from the Philippines and Malaysia, this palm is now grown throughout the tropics. Finally, in India, the golden Monterey cypress (Cupressus macrocarpa ‘Goldcrest’) is growing in popularity as a Christmas tree, but otherwise, Christmas is little celebrated in India. The traditions of using Christmas plants are more firmly established in South Africa than in the center and north of the continent, brought to this region by European settlers (notably the Dutch and English). Again, though, with the seasons being inverted, the South African Christmas plants are very different from those in the Northern Hemisphere. Notably, the hortensia (Hydrangea macrophylla), well-known in the North for its summer bloom, is called “Christmas flower” and is by far the most popular Christmas plant! On the other hand, poinsettias are catching on as well. They have to be specially prepared in order to bloom at Christmas rather than in May, which is when they’d bloom if left on their own. Local nurserymen manage to do this by covering their production greenhouses with black cloth after 4 pm to ensure the short days necessary to stimulate bloom. Various native plants also serve as Christmas plants, such as Christmas bush (Pavetta spp. ), Christmas bells (Sandersonia aurantiaca) and Christmas berry (Chironia baccifera). Several plants imported from Australia, which has a similar climate, are also appreciated for their winter bloom. You’ll read more about those below. Africans also celebrate Christmas with many plants that are for us just typical summer flowers, like daisies, roses and zinnias. Christmas trees are very popular in South Africa, but they use as subjects conifers adapted to local conditions, such as cypress (Cupressus spp., including C. macrocarpa), Japanese cedar (Cryptomeria japonica) and various pines (Pinus spp., including P. radiata). In Australia, the traditional Christmas tree is the native Norfolk Island pine (Araucaria heterophylla). Grown in mostly as a houseplant in the northern hemisphere, where it rarely exceeds 5 feet (1.5 m) in height, in Australia, it can eventually reach up to 250 feet (65 m) in height, about 20 floors! Other mild-climate conifers from various parts of the world are also used as Christmas trees, including various pines. And Australians have their own Ozzie Christmas tree, Nuytsia floribunda … but it’s not a conifer, but rather a broad-leaved tree. Moreover, it’s a parasitic tree (or rather hemiparasitic tree, since it does carry out its own photosynthesis) that steals most of its water and minerals from nearby plants! The Australian Christmas tree produces frothy spikes of orange-yellow flowers just in time for the holidays. Mention Christmas tree to any New Zealander and they’ll immediately think of Meterosideros excelsa, a rounded broadleaf tree with feathery red flowers at Christmas. It’s called the New Zealand Christmas tree or pōhutukawa. And an introduced bulb from South America (Alstroemeria psittacina), with green-tipped red tubular flowers, has “gone native” and is well-known by locals as New Zealand Christmas bells. So, wherever you travel around the world, there are always interesting Christmas plants to discover! If you know of other Christmas plants, do not hesitate to let me know about them at laidbackgardener@gmail.com. In Britanny, you can see endless bigleaf hydrangea hedges. I get to see spectacular bigleaf hydrangeas when I travel to milder climates. I’ve seen hedges of them 8 feet (2.5 m) high and just as wide in Brittany, France, covered with hundreds of purplish blue globular flower heads. And outstanding specimens in Vancouver, Virginia and the Azores. It’s enough to make any gardener want to try them! But that’s not so easy in colder climates. You see, although nurseries stick labels with encouraging hardiness zones like zone 5 or even zone 4 in the pots of bigleaf hydrangea, in fact, these are essentially zone 6 plants, and zone 7 is even better. Like many shrubs, you can grow them beyond their normal hardiness zone, but with decreasing results as the climate gets colder. Where I live, in USDA zone 3b (AgCan zone 4b), for example, they die back to ground or nearly so in most winters. And they only bloom irregularly, on much shorter plants. Yet, you can get them to bloom quite well, even into zone 3a. The secret is to convince them they are growing in zone 7! 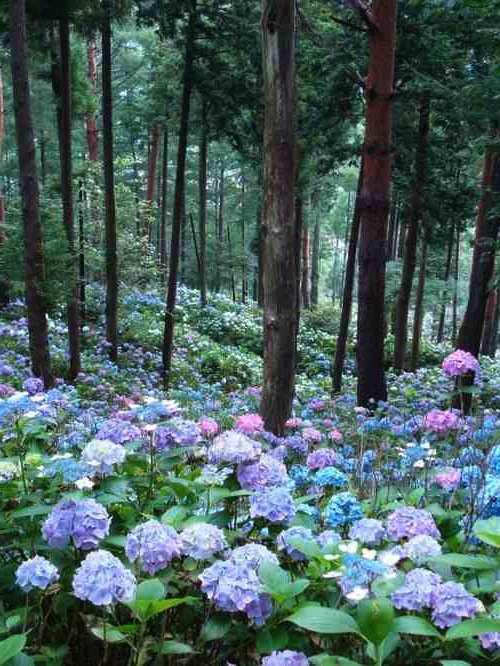 In Japan, bigleaf hydrangea fills forests with its blooms. The bigleaf hydrangea (Hydrangea macrophylla) has several common names: hortensia, florists hydrangea, French hydrangea, blue hydrangea, etc. It’s native to Asia, especially Japan,where it grows in deep forests at the foot of tall trees, well protected from the wind. In North America, it’s often sold as gift plant for Mother’s Day or Easter, but, although it can survive for short time indoors, it really needs cool winters to bloom again. Therefore the bigleaf hydrangea doesn’t really make a good houseplant. Alternatively, it is also widely used as an outdoor shrub in milder climates. This hydrangea offers two flower types. The original form is the lacecap hydrangea, usually shortened to simply lacecap, which produces, at the end of each stem, a large flat umbel of small fertile florets surrounded by a ring of much larger sterile florets with 4 very broad petals. The showy sterile florets attract pollinating insects to less attractive fertile flowers in the center. There are many lacecap varieties, but few are commercially available, ‘Twist-n-Shout’ being one exception. The popular ‘Endless Summer’ is a mophead type, with rounded balls of sterile flowers. 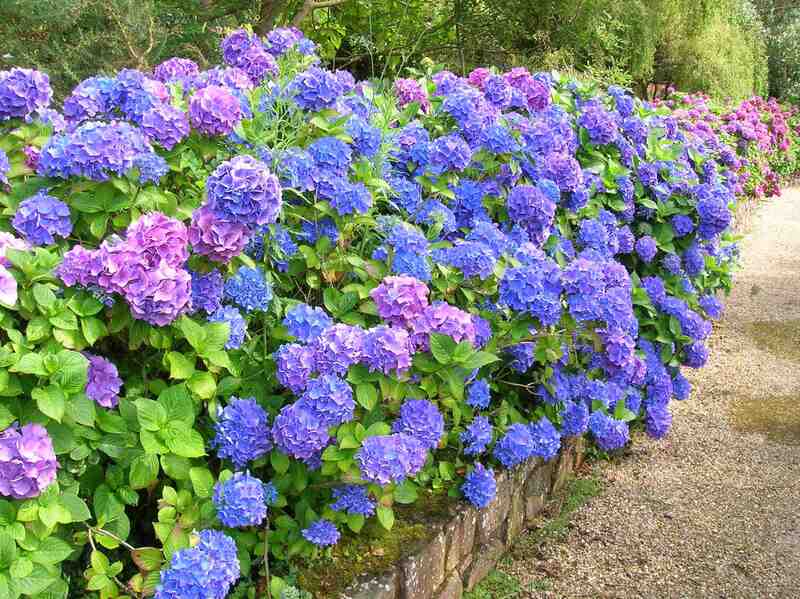 Varieties with globular inflorescences, called mophead hydrangeas or simply mopheads, which are by far the most popular in culture. They originated as mutations from the lacecap types. They are almost entirely composed of sterile, large-petaled flowers and are therefore very showy, although not too attractive to insects, as they offer no pollen or nectar. There are hundreds of mophead varieties, including the popular garden variety, ‘Endless Summer’. To really flourish, the bigleaf hydrangea needs a fairly cool summer and a moderately cold winter, but without a prolonged period of freezing. It will happily grow in full sun in areas with cool or foggy summers, but elsewhere does best in partial shade and even in fairly deep shade, because the soil and air are cooler and more humid there. Because of its large leaves, this hydrangea loses a lot of water to evaporation and will require frequent watering in drier spots. That’s why you won’t find it widely grown in hot, dry climates such as southern California, nor does it thrive in windy spots. 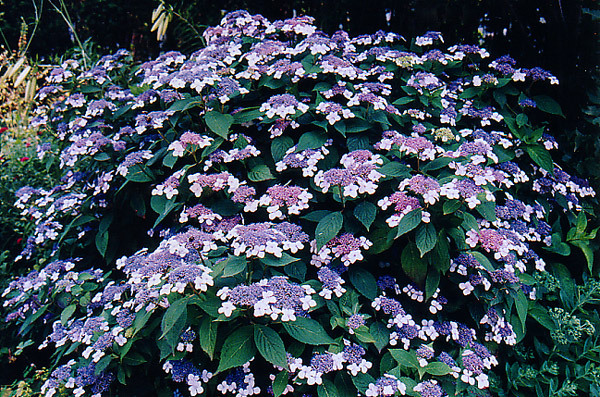 The bigleaf hydrangea likes soil rich in humus that remains slightly moist at all times. So add plenty of compost to the soil at planting time. Always use a mulch as well: it will keep the soil cooler and moister. Mulches that decompose into rich compost, like chopped leaves and ramial chipped wood, are ideal. Fertilize using an slow-release all-purpose organic fertilizer, especially in naturally poor or sandy soils. Avoid nitrogen-rich fertilizers (ones where the first of the three numbers is highest): they tend to stimulate foliage growth at the expense of flowers. Purplish to pink to blue flowers on the same plant usually mean the soil is neither acid nor alkaline. 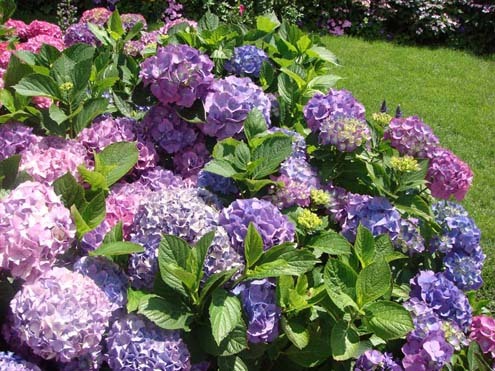 One unusual characteristic of the bigleaf hydrangea is that its flower color changes according to the soil type: its flowers will be blue in acid soil (a pH of less than 5.5) and pink in alkaline soil (a pH of more than 6.5). In between, at a pH of 5.6 to 6.4, many varieties will show various shades of pink to purple to blue, even on the same plant. The blue coloration is due to the presence of aluminum (a widely available element found it most soils). It is more readily available to plants in acid soils which therefore tend to produce blue flowers and becomes fixed and unavailable in alkaline soils, leading to pink flowers. In most of eastern and northern North America, soils are naturally acidic enough that flowers tend towards the blue side. 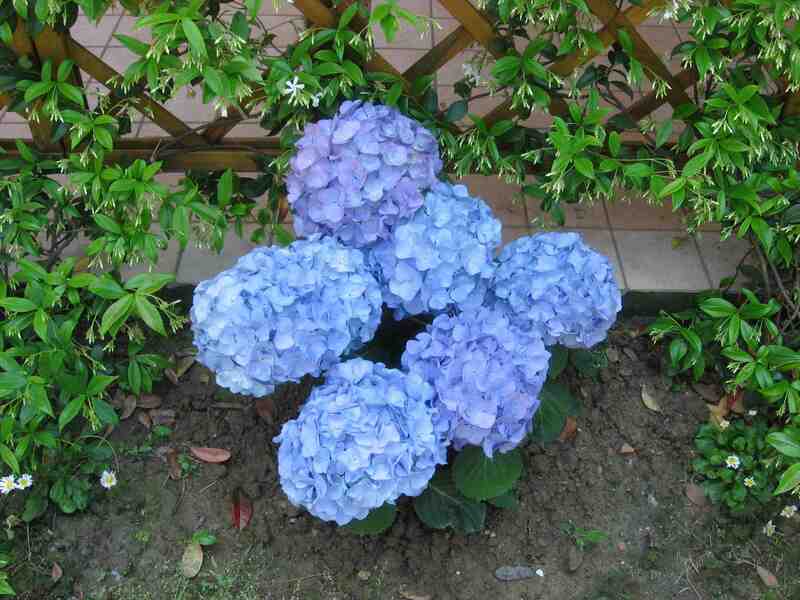 If they’re not blue enough for your taste, try lowering the soil pH with sulfur treatments. Even just applying peat moss (an acidic soil amendment) at planting and following that with a peat moss mulch will often give just as good results. Garden centers often recommend adding aluminum sulphate to the soil, but this product can be toxic to plants if not used very carefully and I don’t recommend it. At any rate, most soils contain an abundance of aluminum: why would you want to add more? Fewer people seem to want their hydrangeas to be pinker, but if so, apply an alkalinizing agent, such as lime, to the soil. Red and purple varieties too tend to be more intensely colored in alkaline soils. Unless your soil is naturally lacking in aluminum, you’ll find it is harder to get a clear pink in bigleaf hydrangeas than a true blue. Note too that there are biglear hydrangeas with white flowers. They tend to relatively unaffected by the acidity/alkalinity of the soil, simply turning somewhat pinkish or bluish as they age. My suggestion: first ensure the survival of your hydrangea by offering the best conditions you can. Only later, when you have mastered its culture, should you consider whether you want to meddle with its color. Considerable confusion arises from the fact that various species in the genus Hydrangea have very different pruning needs. Most hydrangeas bloom on new wood: the new stems that appear in the spring. 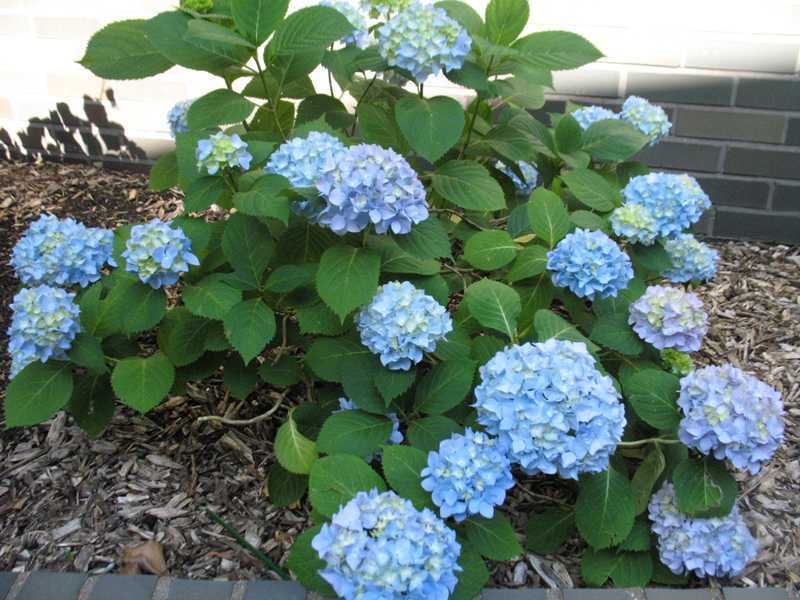 You can prune these hydrangeas severely in the fall or spring without reducing their bloom. This group includes the popular smooth hydrangea ‘Annabelle’ (H. arborescens ‘Annabelle’), with its big balls of white flowers in mid-summer, as well as the nearly as popular panicle hydrangea (H. paniculata), a later blooming plant with more elongated inflorescences that change from white to pink as they age. The bigleaf hydrangea is exactly the opposite: it blooms on old wood, that is, the stems produced previous year. So it’s branches already bear the buds of the flowers of the following summer as they go into winter. 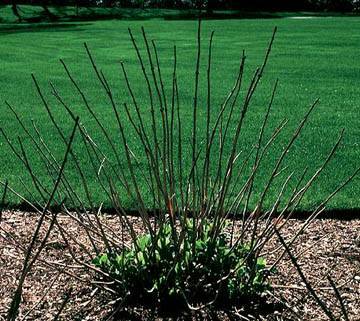 If you prune this plant heavily in either fall or spring, eliminating all the branches, it will not flower because you’ll have removed the flower buds for the coming summer. Be careful what you read on the Internet about pruning this hydrangea and especially where the information comes from! Advice given for mild climates will often suggest pruning quite severely after flowering to control the plant’s growth. However, that kind of pruning is not applicable to hydrangeas grown in cold regions! You’ll see: the cold will keep their growth in check! This hydrangea has died back nearly to the ground: simply prune back the dead wood. In cold climates (certainly zones 3, 4, and 5 and quite possibly even 6), it is better to never prune living stems, especially not in the autumn! You can remove dead flower clusters, but nothing more. Instead, wait until late spring before pruning. In cold climates, there will inevitably be winter damage and in fact, most of the branches will freeze at least in part. If they freeze to the ground, the plant will probably grow back, but will not bloom that year. On the other hand, if even a short section of the branch is still alive in the spring, it will contain buds that will bloom. So pruning is really very simple in cold climates: just remove the dead wood (easy to recognize because it bears no green buds!). And do it in the late spring, cutting back to about 1/2 inch (1 cm) above the living bud. Why Don’t Reblooming Varieties Rebloom? Some cultivars, like ‘Endless Summer’ and ‘All Summer Beauty’, are said to flower on old wood in early summer, but also on new wood, later in the summer, providing a second series of flowers and therefore continuous flowering throughout the season. They said to be “remontant”, a horticultural term that essentially means “they bloom again”. Plus, sellers state, “even if the buds are damaged in winter weather, the plant can still ﬂower on wood it produces that season”. Great in theory, but not so real in practice. In colder climates, this simply doesn’t work… not after a cold winter, at any rate. I have never seen a clear explanation for this (if anyone knows the cause, I’m all ears! ), But I have my own theory. I suspect this second flowering occurs not from truly new shoots that emerge from the soil in the spring, but from secondary sprouts arising from those that survived the winter. So even as its branches are flowering, new buds begin to form at their base, ready to take over. However, to get this second flowering, the plant would need to have branches have survived the cold. The end result is that, in zones 3, 4 and 5 at least, remontant hydrangeas like ‘Endless Summer’ could better be called “Flowerless Summer” many years. If you can’t create the conditions necessary for the first blooming to occur, the plant is unlikely to flower at all. Curiously, the bigleaf hydrangea often blooms better in cold, snowy climates than somewhat warmer ones. Why? Because snow acts as a very good insulator. Where snow falls early, in abundance and stays late, it protects overwintering branches, the ones bearing the flower buds. In climates where snow is only sporadic, melts away repeatedly in winter, or disappears too early in spring, branches will tend to freeze and therefore, bye-bye bloom. In the colder regions, snowy or not, it is always wise to properly protect bigleaf hydrangeas. Not with a rose cone or geotextiles, as the temperature inside those shelters starts rising too quickly in the spring, pushing the hydrangea to produce new shoots too early… and these are inevitably killed by a late frost. Instead, you need winter protection that slows spring growth or, looking at it from a different point of view, that prolongs winter. And for that, nothing beats a good layer of dead leaves. 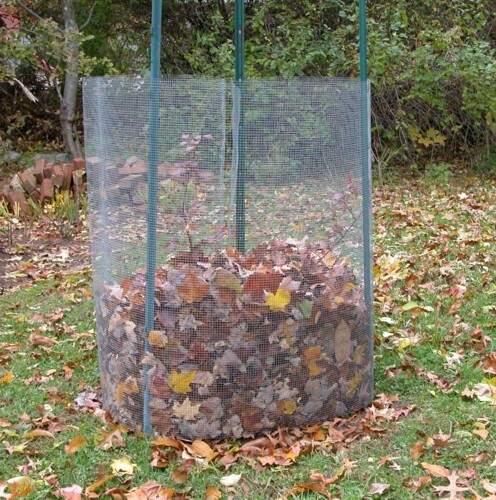 Dead leaves: the Best Winter Protection! Dead leaves are the very best winter protection! In the fall, after the first frost, cover your hydrangea with 1 foot or even 2 feet (30 to 60 cm) of fall leaves (you can surround the plant with a “cage” of chicken wire to better hold them in place). Leaves tend to remain cold and moist for a long time, even when the spring sun behinds to warm things up elsewhere, and that’s what you want. Wait until very late spring, when there is no longer any risk of frost, before removing the leaves, usually about the end of tulip season. The mulch will keep the soil cold longer, delaying the start of vegetation… and protecting your future flowers. When you finally do remove the leaf mulch protection, be ready to cover your hydrangea in case of a late freeze. A large pot or bucket placed upside down over the plants should be sufficient to keep the frost off. Be careful when removing dead leaves: the plant will already starting to grow under leaves, with pale swelling buds or new shoots and you don’t want to damage them. This is the time to prune, removing dead wood only. With this treatment, you have a good chance of seeing your bigleaf hydrangea flower almost every year, even into zone 3! Even so, some cultivars are better adapted to cold climates than others. Varieties sold as Mother’s Day plants were chosen to be easy to force and therefore bloom early, exactly what you don’t want in a cold climate. They rarely make good choices for outdoor planting further north than zone 7. ‘Penny Mac’ is said to be the hardiest bigleaf hydrangea. Among the cultivars that are more cold-resistant, slower to sprout in spring or both, and are therefore the best choices for northern gardeners, there are: ‘All Summer Beauty’, ‘Blushing Bride’, ‘Rose Bouquet’, ‘Early Sensation’, ‘Endless Summer’, ‘Let’s Dance Moonlight’,’ Let’s Dance Starlight’, ‘Let’s Dance Big Easy’, ‘Nikko Blue’, ‘Pink Beauty’ and ‘Twist-n-Shout’, plus such series as ‘Forever and Ever’ and ‘Cityline’. ‘Penny Mac’ has the reputation of being the hardiest and the most floriferous of all the big leaf hydrangeas. It is readily remontant when given decent conditions. There you go! I have now shared all the secrets for successfully blooming a bigleaf hydrangea in a cold climate. 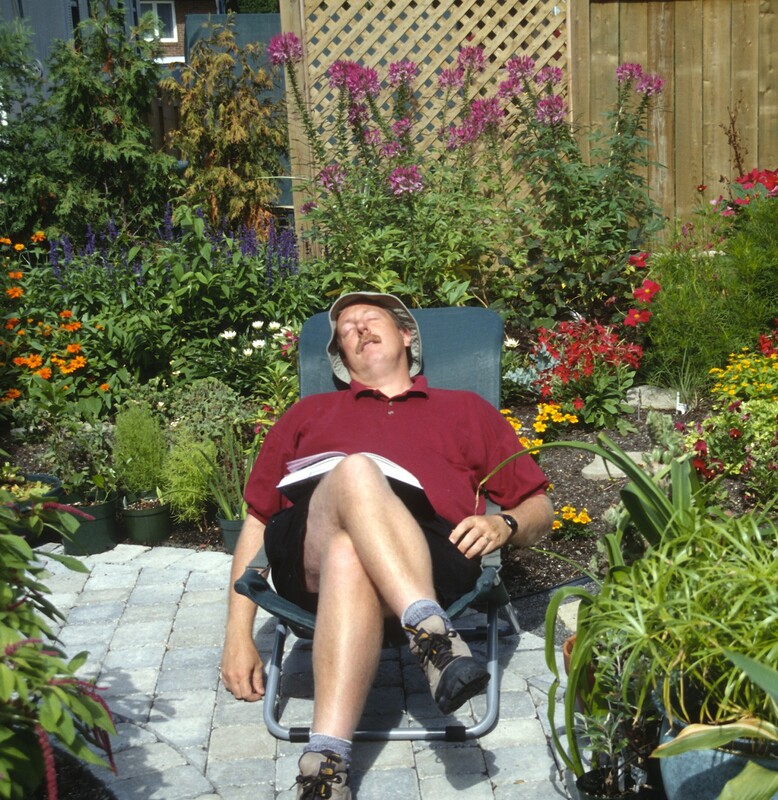 But I find the above too much work for a laidback gardener. Personally, I give my big leaf hydrangeas no special care other than planting them in a suitable location: in a protected spot in part shade with moist, rich but well-drained soil where autumn leaves naturally accumulate. I’ll admit my results are variable: there are good years with lots of bloom and bad years with little to none. I just figure I appreciate the flowers all that much more when they’re a pleasant surprise than a forgone conclusion!